There have been a slew of holocaust dramas released in cinemas that attempt to show the Second World War from a different cinematic perspective. Defiance is another film to add to the list, and the “gimmick” that director Ed Zwick has decided to employ is that the characters in Defiance are Jews fighting for their freedom – rather than being helpless victims like they are in most WWII films. 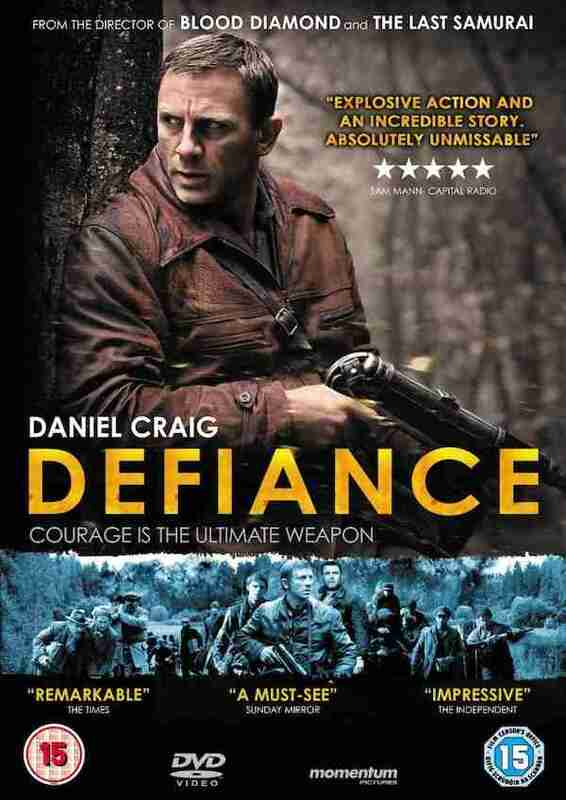 Defiance follows three Polish-Jewish brothers -Tuvia (Daniel Craig), Zus (Liev Schreiber) and Asael (Jamie Bell) whose family have been killed by the invading Nazi forces, they’ve taken refuge in the woods and on one of their searches for food they discover a young boy whose family has been killed. Soon word spreads of their deed and soon more Jews come in search for them and soon a community is set up in the woods and the brothers become local legends. 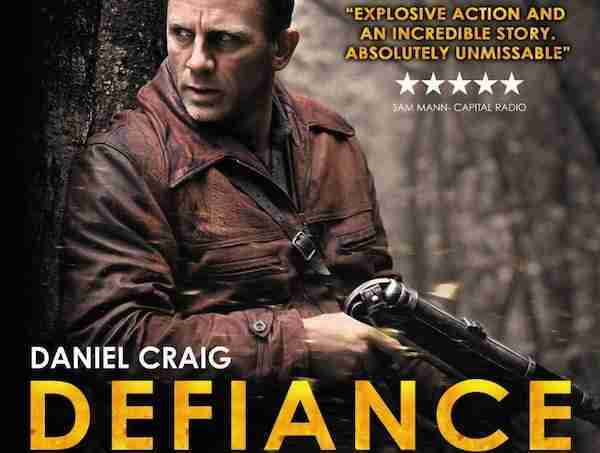 With a cast headlined by Daniel Craig and Liev Schreiber it would be difficult to call Defiance a bad movie; it’s far from it, however it’s not great either. It is just ‘good’ and that’s the main fault with the film. The blame can’t be placed on the actors as they do a good job – even with Eastern European accents, and the plot (based on a true story) has a unique enough angle to make it stand apart from other war films, even if the script isn’t Oscar material. No, the blame has to lay at the door of director Ed Zwick, a director who takes films with an interesting premise and somehow manages to make them all rather average. Whether it be Legends of the Fall, The Seige or The Last Samurai all of Zwick’s films manage to feel like big budget TV movies that lack real passion or guts. Considering the acting pedigree that he works with this is most bizarre and my only logical reasoning being is that Zwick’s vision outweighs his talent. James Newton Howard’s musical score is excellent and haunting – but it sounds too much like his music from The Village, maybe he can see the logical link between trees and violins but I can’t. The cinematography is dark and bleak and lack any sort of emotional resonance, giving the film a cheap shot in Eastern-Europe-feel. I know it was shot in Lithuania, but it couldn’t have been that cheap, could it? The story of Defiance plays like a strange amalgamation of various genres and films. Part-Schlinder’s List part-Robin Hood with a healthy mixture of Braveheart thrown in for good measure, Zwick along with his cast and crew can’t be called lazy when sourcing their “homage” to other films. In fact Craig’s address to his ‘forest family’ on horseback is verging on laughable with its Braveheart parallels. I wonder what Mel Gibson would think? Daniel Craig shows that he has an acting career outside of the James Bond franchise. The man has screen presence and charisma and it’s easy to see why he was drawn to the Defiance script and he’s given a strong lead role in a movie that has some historical and emotional weightiness which must have surely been Oscar bait when it landed on his desk. The bear-like Schreiber is also good as the middle volatile brother who tends to think with his heart and not with his head. While it may seem like I’m against Defiance I must stress that I did enjoy it – it’s a good Sunday afternoon film that’s quite old fashioned. If anything I’m angry at Zwick for not doing more with the material and his cast. While it may not set the world on fire with tension and drama Craig and Schreiber deliver solid performances in this WW2 film with a twist. If you are looking for a good Sunday afternoon movie – you should watch Defiance. Included on the Defiance DVD is the obligatory trailer and Return to the Forest: The Making of Defiance. It’s 26 minutes long and it’s pretty much what you would expect it to be – with a lot of talking heads and backslapping. Also included is a “noble” commentary by director Zwick.